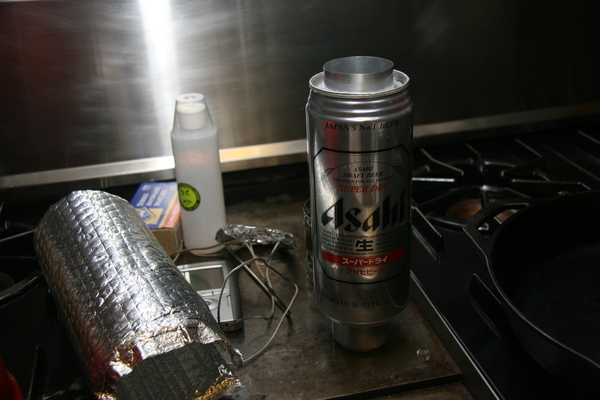 I've been playing with making alcohol-burning Kelly Kettle (aka Volcano Kettle) style cooksets out of aluminum drink cans. 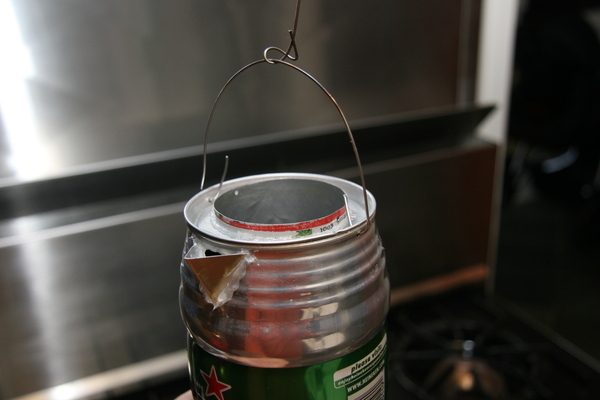 First up is a kettle made out of a 24oz Heinekin can. 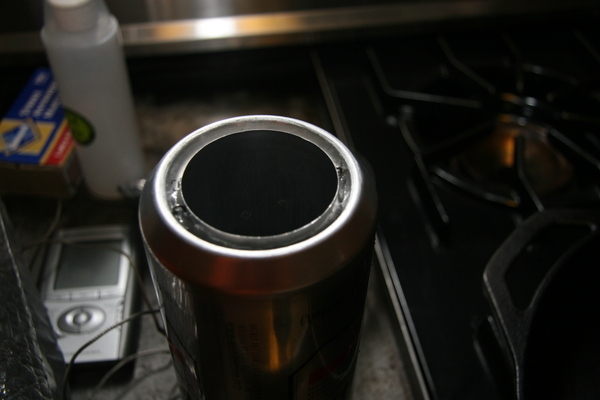 Holes are drilled through the top and bottom and a chimney made from the bodies of two stacked 5.5oz V8 cans is fit into the middle of the Heinekin can. 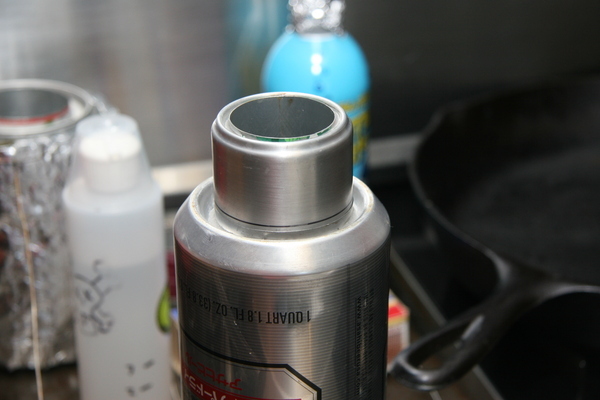 There is a wire bail from which the kettle may be hung, as seen here: Also visible is the spout; a church key can opener was used to make a hole in the side and a bit of folded aluminum silicone-glued around it. To speed filling and pouring a 1/16" vent hole was drilled through the top on the oposite side. 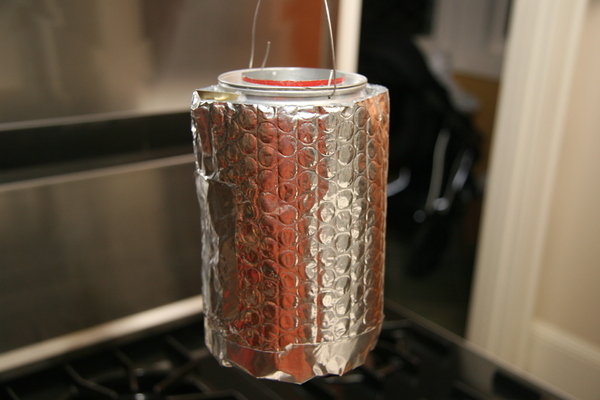 Since the kettle is heated from the inside a cozy made out of Reflectix can stay on it at all times to speed the boil and retain heat after boiling: The insulation also makes it comfortable to handle the kettle with bare hands when it is heating or full of boiling hot water. The kettle's capacity is almost exactly 16oz when filled to the brim. 15oz is a more practicable fill level. The stove fits into the bottom and is described below. Since the capacity was a little tight I made a larger kettle out of a 1L Asahi Super Dry can using roughly the same design, with some refinements. The chimney was made from two 8.4oz Red Bull cans since the V8 cans aren't tall enough. The diameters are the same. For this kettle, I removed the graphics on the chimney cans, since it wasn't clear to me that the paint wouldn't contaminate the water. The spout is cute, but seems like it would be prone to damage when packed, so for this one the fill/pour hole was drilled through the top and enlarged using a Dremel grinder bit. (The vent hole is sort of half visible too.) The chimney extends extra far on this one for no particular reason; it could probably be trimmed down, although it should extend a little to keep water out of the chimney (and thus the stove). 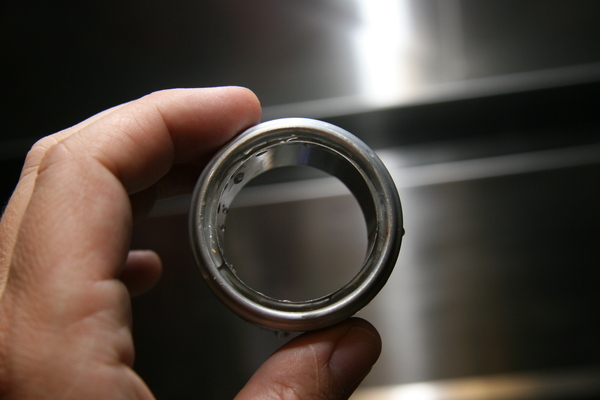 The bottom joint on both kettles has a bead of JB Weld for strengh which shouldn't contact the water. 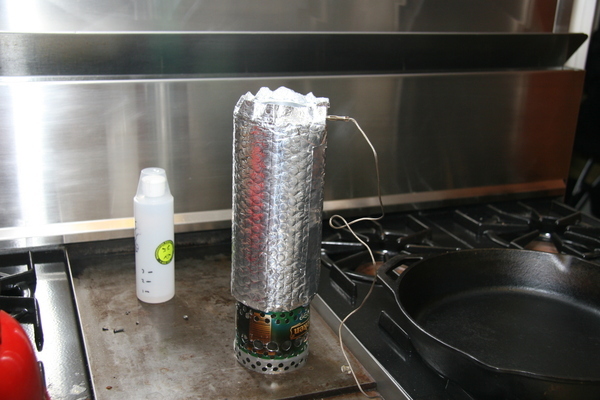 For this kettle I also embedded some (as yet unused) wire loops in the expoxy to give options for securing the stove to the kettle: On the top joint I use silicone glue since it's more likely to come in contact with your water and more toxic epoxy would be overkill. 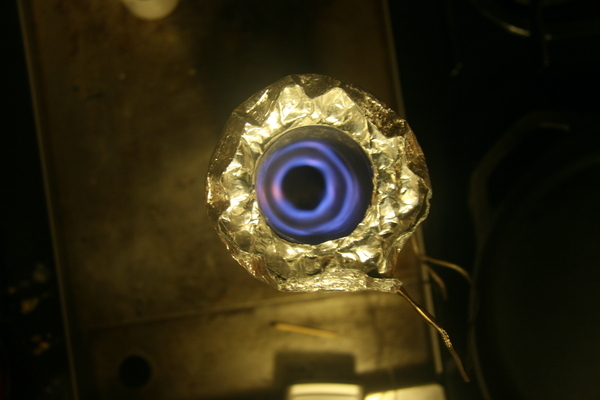 This top view shows the flame pattern while burning. The outer ring of flames is just a reflection of the inner ring, the actual flames. Here's the stove that works both kettles. 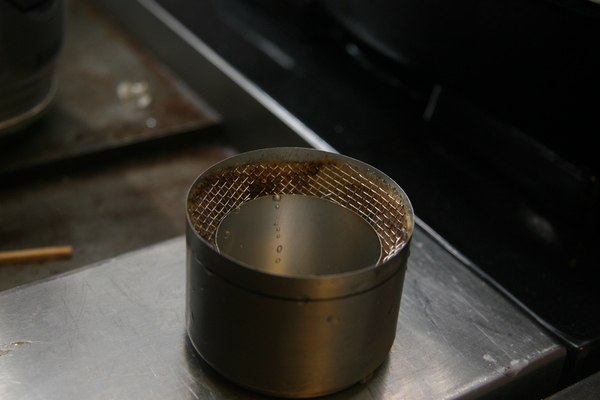 and here again fitted into the bottom of the (inverted) Asahi kettle. The black line is just a reference to help make sure the stove fits evenly in the kettle. For the Asahi kettle the bottom of the chimney was expanded a bit so that the stove could slip into it; it holds there securely (and is a little hard to remove). The outer shell is the lower 1 1/4 inches of a 5.5oz aluminum (e.g. V8) can. 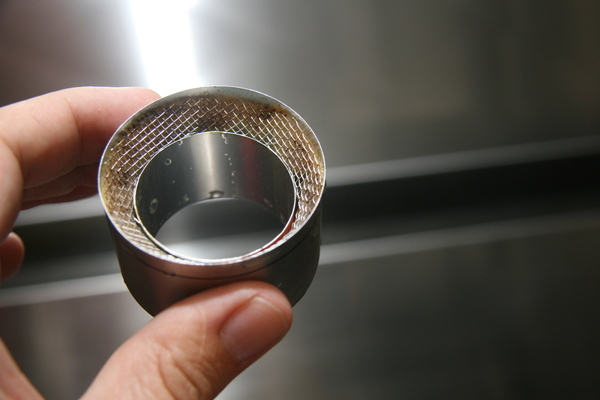 The bottom is drilled out in the middle with a 1 1/2 inch diameter hole. 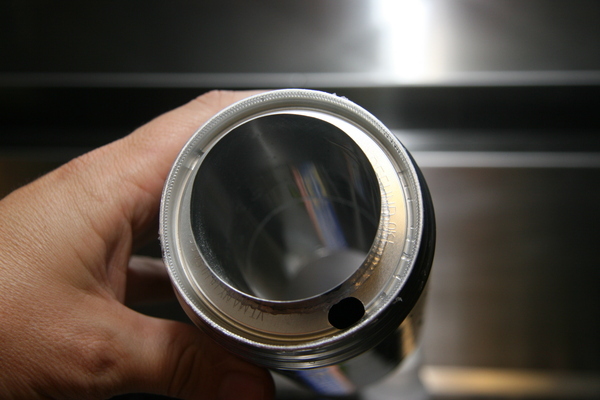 A 1 1/8 inch portion of the upper part of the can is rolled up tighter to fit and expoxied in the hole to form the inner wall. You can sort of see that in this bottom view: The space between is filled with fiberglass pipe insulation and covered by wire screen that climbs at 45° from the inside edge to the outside wall. This top-ish view might give a better look at that: The stove's capacity is about 1 fl. oz. To fill it I ease alcohol through the screen using a squeeze bottle. It's also possible to fill while it's on the kettle by dripping fuel down the sides of the chimney, which makes for a spectacular start when you light it. Using ethanol for fuel, my fuel use efficiency goal is to approach 50% efficiency, i.e. 3.65 Cal/g, which would be enough to boil 1/2L of ice-cold water with 14g of fuel. The Heinekin kettle will boil 15oz of 23°C tap water using 12g of fuel, which is just about 3 Cal/g (41% efficient). That's really better than I expected to do. The boil takes about 7 1/2 minutes. For some reason I don't understand, the Asahi kettle is noticeably less efficient, whether filled totally or to 16oz. It's somewhere around 35% efficent at 2.5 Cal/g. My tests have all taken place in my windless kitchen so far. My theory, though, is that the flame is very well protected from wind and no further screening will be needed in windy conditions. Attempts to improve performance by adding baffling to the chimney have so far failed.